Create a custom look without the luxury price tag with the Aston Langham 48 in. x 35 in. x 77.5 in. Frameless Shower Enclosure with Durable Fiberglass-Reinforced 2.5 in. Acrylic Shower Base. Masterfully designed of modern industrial components with superior craftsmanship, this shower enclosure will add luxury and functionality to your bath instantly. Your choice of either chrome or stainless steel finished hardware accentuates the fluid design with matching right hand shower base installation makes it a complement to any bath. Complete with 3/8 in. (10 mm) premium clear ANSI-certified tempered glass and deluxe seal strips to prevent leakage; you will enjoy every showering experience in this frameless enclosure. A high-end solution for any upcoming remodelling project, the Aston Langham 60 in. x 35 in. x 75 in. Completely Frameless Sliding Door Shower Enclosure will provide beauty, quality and functionality to your bath. The clean, modern look will create a desirable focal point that will optimally upgrade the bath. This completely frameless enclosure is constructed of premium 10mm ANSI certified tempered glass, is engineered for reversible door configuration (for left or right handed installation) and is accentuated with your choice of either chrome or stainless steel finished hardware. This shower enclosure will add luxury and functionality to your bath instantly. 2.5 in. acrylic low-profile shower base is not included. Moselle 60-Inch x 35-Inch x 77 1/2-Inch Frameless Sliding Shower Door Enclosure in Stainless Steel Establish a brand new look for your bathroom with the Aston Moselle 60 in. x 35 in. x 77.5 in. Completely Frameless Sliding Shower Door Enclosure with matching 2.5 in acrylic low-profile left drain base. With the Moselle completely frameless sliding door shower enclosure, you can achieve a luxurious showering experience in a corner space. 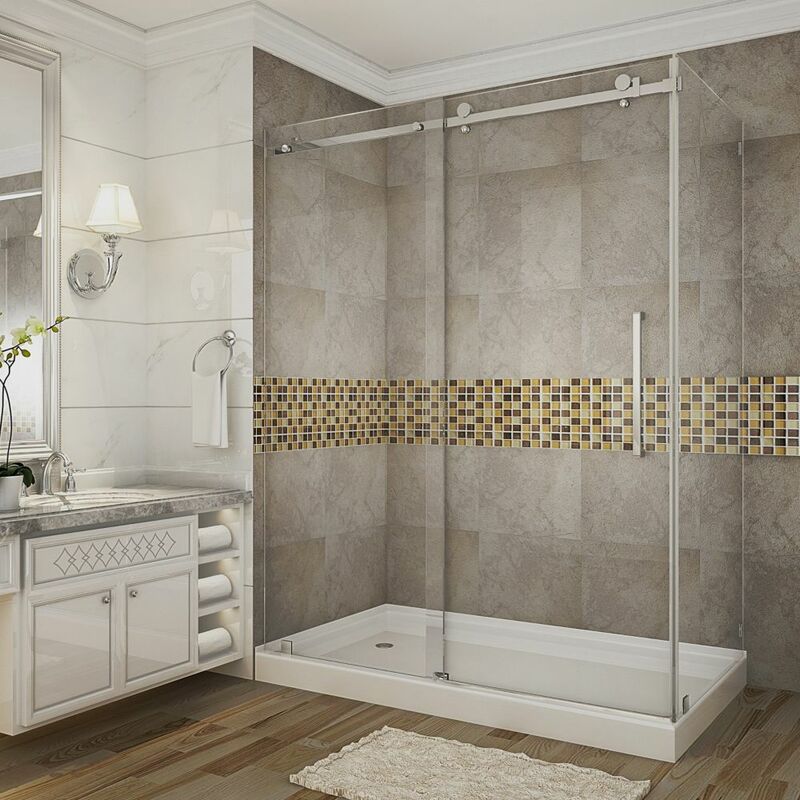 Accentuated with either chrome or stainless steel finished hardware, premium 10mm ANSI-certified tempered glass and deluxe full-length clear seal strips to prevent leakage, this European-inspired door will add both luxury and functionality to your bath instantly.